Combined Heat The top and bottom heating elements combined with the circular heating element and the fan provide a perfect heat distribution to ensure a homogeneous cooking as well as energy savings, since the preheating phase is no longer necessary The Drying Function Enables with a selected temperature management to dehydrate fruit, herbs and vegetable . This function prevents the spread of bacteria and enables to conserve the minerals and vitamins Mode CHEF Exclusivity. In CHEF MODE, the oven will manage all cooking parameters. (temperature - cooking mode and time). The dish just needs to be placed at the rack height recommended on the display, and it will be cooked to perfection. That's it. This exclusive technology patented by De Dietrich allows you to prepare 9 of your most frequently-cooked meals automatically. You simply choose the dish on your menu and put it in at the correct height, as recommended by the oven which adjusts all settings automatically. After choosing a preprogrammed recipe and entering the weight of the dish, the oven automatically determines the appropriate cooking mode, as well as the ideal temperature and the cooking time required down to the minute. This spacious cavity makes it as easy as can be to prepare large or wide dishes, with six different shelf levels easily identifi able on the sides of the oven so that you can follow its recommendations and place your cooking dish at the ideal height. 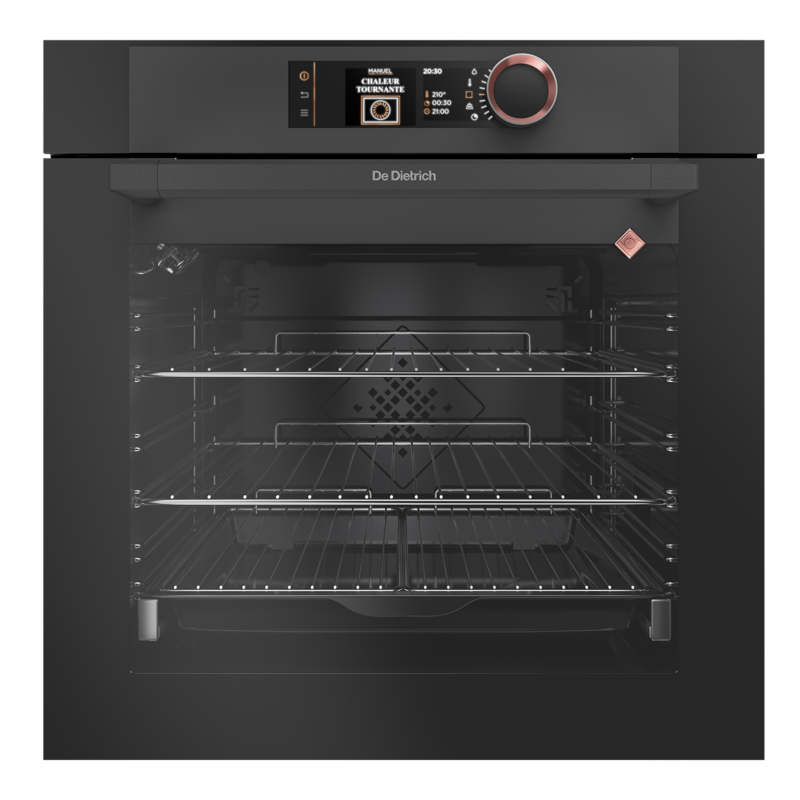 This patented system, exclusive to De Dietrich, enables the oven door to gently close itself. The ultimate comfort of soft closure. The rolling rail system enables you to slide racks and dishes in and out of the oven with the greatest of ease.